Using white earthenware clay, each saggar bowl or vessel is made on a potter’s wheel. After drying, it is sanded and hand burnished to a shiny surface with a smooth stone.Several layers of a fine clay slip, terra-sigillata, are applied and the piece is polished again with a soft cloth before being bisque fired to 1830°F. After cooling, the piece is put in a saggar, an enclosed clay container, packed with combustible materials, such as sawdust, salt marsh hay, or seaweed which have been soaked in solutions of salt, iron, cobalt, or copper oxides. The saggar is then fired in a gas kiln. The fire, salt and combustibles all dance on the surface of the pieces, leaving distinctive marks. The saggar process yields a beautiful melding of patterns, designs, textures, and colors. Each of my unique shard pots begins on the potter’s wheel and then is trimmed and dried. After being sanded, it is hand burnished to a shiny surface with a smooth stone. I apply several layers of a fine clay slip called terra sigillata and I polish again with a soft cloth. The piece is then fired to 1800 °F. 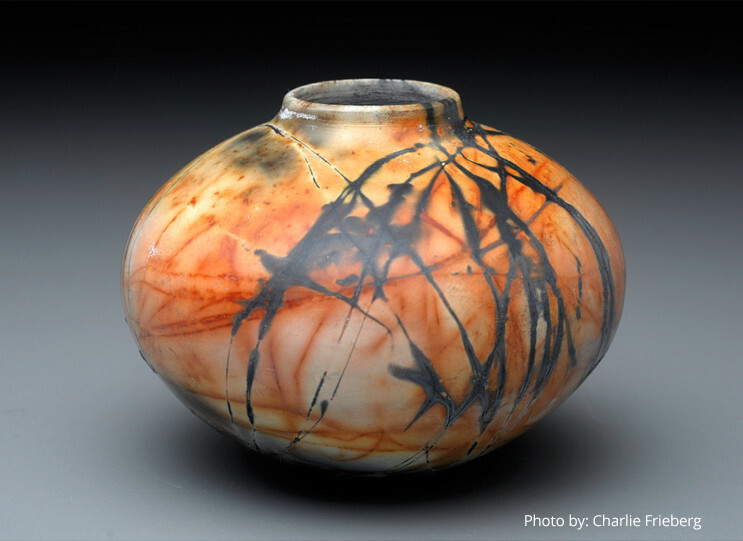 After cooling, the form is broken into several pieces, and each piece is decorated with stamps, copper wire, tape or string, and then packed into an individual saggar. A saggar is an enclosed clay container packed with combustible materials such as sawdust, salt marsh hay, or seaweed, which have been soaked in solutions of iron, cobalt, copper, or yellow ochre oxides. The saggars are then stacked and placed in the gas kiln to be fired. The fire, salt and combustibles all dance on the surface of the pieces, leaving distinctive marks. Once cool, the pieces are reassembled and glued together, yielding a beautiful melding of patterns, designs, textures, and colors. No two are ever the same - the mystery of the materials is always a visual wonder to behold. Made from white earthenware clay, each Indian pot finds its form is on the potter’s wheel. After it has dried to a leather hard consistency, it is polished with a smooth stone. The surface will eventually become very smooth and shiny. After the clay dries completely, I apply several thin coats of Terra Sigillata and polish in between each coat. Terra Sigillata is a fine clay slip that is applied with a brush leaving behind a white surface. The piece is then fired in an electric kiln to 1800 degrees Fahrenheit. After cooling, it is packed into a saggar. A saggar is an enclosed clay container in which my piece and combustible material will be set into. Combustible material such as salt marsh hay, seaweed, corn husks and sawdust are soaked in a solution of iron, cobalt, copper or yellow ochre oxide. These combustibles and copper wire are wrapped around the piece and placed in the saggar, covered and fired in a gas kiln. The fire with the help of salt and combustibles will dance upon the surface and leave beautiful marks. These colors and marks are permanently embedded onto the surface.